Accidents happen. One moment you’re driving or riding your bike to work and suddenly your entire day is turned upside down. Even worse, some accidents can result in piles of bills, unpaid expenses, and injuries that can alter the course of the rest of your life. While victims have the right to compensation, you need to prove the other driver was negligent. To do that, you need the help of a personal injury attorney. However, it’s not like everyone has the cash for lawsuits just lying around. That’s where legal funding or personal injury funding can come in handy. Applying for funding for lawsuits is a pretty much no-risk decision because legal settlement loans are considered non-recourse. This means that you’re not required to return legal finance loans if you don’t win your case. The loan is repaid from your compensation, and only if the compensation is more than the loan you got. Many people don’t even consider legal funding for lawsuits because they’re concerned their credit score is going to affect their chances of having their application approved. However, the only factor affecting legal funding for lawsuits in Tampa are your chances of winning your case. That means there are no credit checks which could be lengthy and in the end, you might not even qualify for the bank loan. If you’ve been in an accident, you’re probably facing unexpected challenges from medical bills to missed wages. It’s no surprise you’re in a hurry to get it over with and settle. However, settling early can do more harm than you think. You’re not leaving your attorney enough time to fight for a fair settlement. 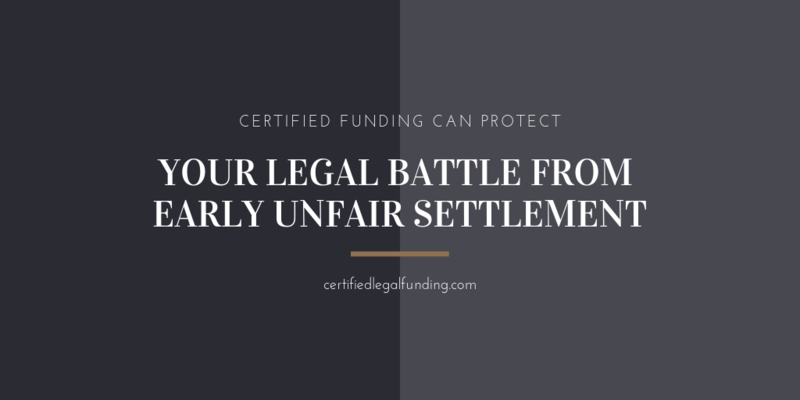 By applying for certified funding, you’re ensuring you’re in no rush to settle, which leaves your attorney enough space to get you the compensation you rightfully deserve. Once your application is approved, you can spend the money as you wish, not just to pay your attorney. We understand that there are other expenses involved in personal injury claims, from missed wages to other living expenses, so no one should dictate how you use the funds. Unlike applying for bank loans, applying for legal funding is pretty straightforward and quick. In fact, you can get an advance in a matter of hours after applying. Many people give up on compensation they deserve because they don’t think they can afford to go through litigation. However, you can take advantage of the benefits that come with legal loans and instantly alleviate financial stress. This will allow you to focus on what matters – your recovery.